This section contains the Sample papers NTS. National Testing Service is the authoritative body which recognizes the GAT, NAT-1 and NAT 2 test for the learners who want to get admissions in universities and colleges. Moreover Sample papers of NTS helps the candidates for their preparation of NTS Jobs test, and also these NTS Solved mcqs are very helpful in solving the test in the exams. Moreover, airport security force test papers also available here. After preparation from NTS past papers candidates can check their ability and knowledge about NTS Syllabus also. NTS mcqs test preparation help the aspirants for admissions in universities and cadet colleges and also jobs in different departments of Pakistan. Generally MCQS comprise of Mathematics (according to Syllabus), NTS English MCQS (Grammar, Tenses, Meanings of words, Sentences etc), NTS General Knowledge MCQS, and Commonwealth Scholarship NTS test sample papers. Test Syllabus consist of NTS MCQS having multiple choice questions (MCQs) usually MCQS of Computer, MCQS of Islamiat, MCQS of Chemistry, NTS English MCQS, and NTS General Knowledge MCQS also. Questions are categorize in different types for example Mathematics, English, Current Affairs and Islamic Studies. In every Test questions are according to the NTS Syllabus which was announce 7-10 days before the test. The test duration of NAT-1 Papers is 120 minutes and there are total 100 multiple choice questions and every questions have four choices out of four one choice is correct while the others are incorrect. GAT General Test is conduct for those students who have usually completed 16 years of education and wants to get admission in M. Phil while the Gat subject test is organize for those students who have complete 18 years of education. National Aptitude Test (NAT) by NTS is a test for admissions in colleges in Pakistan. The NAT is own, publish, and develop by the National Testing Service. Furthermore, Colleges and Universities in Pakistan use the test to assess a student’s ability for admission. Moreover NAT consists of three major parts: Verbal Logic, Quantitative Logic and Analytical Logic. To make easy for the students, All the NTS sample papers are available here. Students can work out these Sample papers NTS so many times until they get understand the pattern of the test as well as know how to pass the test. 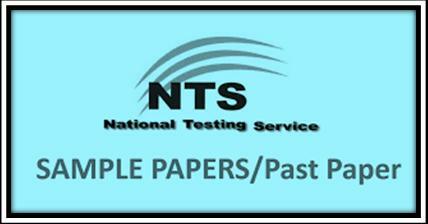 In short online NTS Test Past Papers are very helpful for the students. You can also download these NTS solved Papers. If you wants any model sample papers for nts test preparation. Then tell us we will send you.